Appointments plugin is getting faster with each update and 3.5 is no exception. It now handles thousands of appointments in a snap. We also updated the calendar design both on front-end and back-end so it’s more usable with multiple staff. Since calendar is the main feature of the Appointments plugin, we are constantly improving every detail to make it more useful for our customers and their own clients. 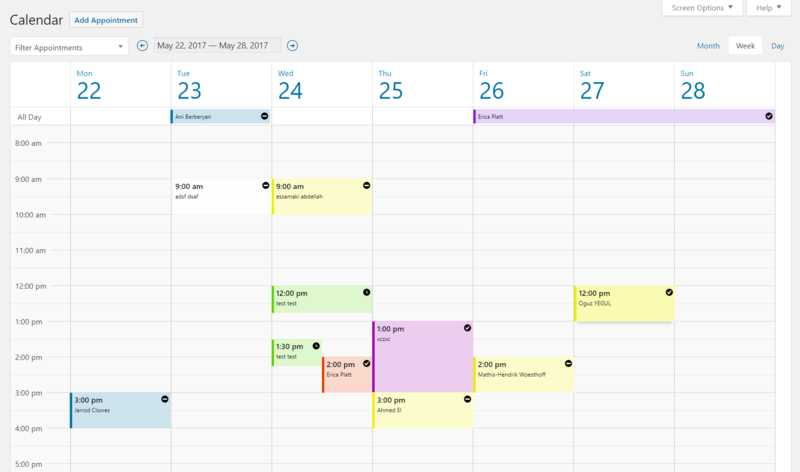 Appointment calendar has been updated a bit and is now more compatible with external themes. It now uses system font across all platforms and is less visually distracting than before. Colors have been standardized with WooCommerce Style Guide and spacing is more even to allow better compatibility with your theme. * Improvement – Updated calendar design in admin. * Improvement – Updated calendar design in frontend. * Fix – When multiple staff is scheduled at once, use max quantity of all combined. * Fix – Make sure CSS classes are accounted for even for disabled days on calendar. * Fix – ‘schedule_fo_’ transient cache not working properly, missing from and to dates. * Fix – Google calendar events don’t remove staff slots, when — No Preference — is selected. * Feature – Allow price overriding by adding equals operator in the costs range. * Improvement – Removed Inventory from Global availability rules to reduce confusion. * Improvement – Add new notice for plugin activation. * Improvement – Calendar page title. * Improvement – Updated translations. * Improvement – Improve error feedback on calendar timepicker. * Improvement – Update sanity check notices and convert them to warnings. * Fix – Staff dropdown should only display the costs related to the staff. * Fix – Prevent deleting products that have bookings associated with them. * Fix – “Scheduled By” column is empty if there’s no email address specified for the customer. * Fix – Restrict Days not working when site is translated. * Fix – Incorrect remaining count on slots when staff overlap. * Fix – Calendar not defaulting to first available date with shared staff.